There is an interesting commonality with psychics. They are typically exposed to their psychic ability at an early age (Sylvia was three), have relatives that are known to be psychic (her mother and grandmother were psychic and her son is following in her footsteps), and therefore aren't deeply discouraged from this ability and allow it to flourish. 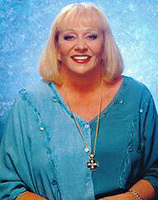 Sylvia Browne utilized her master's degree in English literature and has written several top sellers covering such subjects as meditation, creation, angels, past and future lives, tarot cards, the elements of soul-- just to mention a few. She's been on national television, radio shows and holds seminars throughout the country. Sylvia Browne also is a proponent of hypnosis of which she has a training center. Sylvia's claim to her ability lies in the fact that she resonates at a higher vibrational frequency, a trait imbued since birth. She claims that she knows what heaven is like, that she can see angels and dimensions beyond our normal senses and has spirit guides that she is able to commune with. Like most psychics, she doesn't claim to hold 100% accuracy. She understands that there are many dimensions to what a vision entails, the power of the subconscious mind, her own hidden lessons and that there are parallel dimensions and multiple possible outcomes for any given future. But she's of course good enough to work with law enforcement personnel (free of charge) and has a name well recognized in the psychic community. She also has numerous public prediction failures that will always stand in the forefront, as people want to give hopeful credence to predictions and are greatly dismayed when they aren't correct. Like all psychics, she's got her army of naysayers and critics who go to great lengths to pounce on her inaccuracies and not her successes. The largest (and loudest) critic is of course James Randi who has made it his life's endeavor to prove that nothing exists beyond our five senses. Like the rest of us, he'll find out one way or the other upon his own death. Ịs Sylvia Browne a fake or the real deal? I think she's like most psychics. She has her hits and her misses, just probably more than the average person. We all have psychic tendencies and we too will have our successes and failures. We just don't try and make a professional living at it so aren't under the same kind of scrutiny.